Having done Islay whiskies last month the Whisky Squad chaps decided to go to what is traditionally the other end of the spectrum for this meetup – summer whiskies. Rather than the peated beasts, supped by the open fire as the darkness draws in (waiting, as we all do, for the ultimate inevitability of death…), this time we went for sweeter and, generally, lighter whiskies. Whisky Guy Darren took a back seat this month, chipping in when he found a gap in the proceedings, with the King of Whisky role being filled by Diageo’s Colin Dunn, who I encountered last year at a Burns night (ish) Talisker tasting. He is a man possessed by a strange energy and he filled the room with waving arms, enthusiasm and tasty whisky from his personal collection. He’d been given the brief of ‘Summer whiskies’ and interpreted it as those that he drinks during summer, hence the transfer of 6 bottles from his stash to the upstairs room at The Gunmakers. We started off with a blind tasting of a pair of whiskies, described by Colin as what he would drink on getting home after a hard day at work. Without the usual paper wrappings to cover up the bottle labels Colin and Darren did the pouring while the rest of us dutifully faced away from the table and admired the pub’s wallpaper. Whisky #1 was golden with some fruit, caramel and a hint of salt on the nose, along with an acetoney sweetness underneath everything else. To taste it had some spicy wood and lots of vanilla, and was quite sweet but with a dry woody finish that went on for quite a while. At this point, after holding the whisky in our mouths for a mandated second per year (about 15 seconds for this one, we were instructed), Colin revealed what we were drinking – Dimple 1890. Dimple isn’t readily available in the UK, although it’s very popular in overseas markets, and is the latest name for Haig’s blended whisky, a very old brand (with records showing a mention of John Haig naughtily brewing on the sabbath back in 1655) that is now owned by Diageo. It’s a premium blend with an age statement of 12 years on the regular bottling, but the 1890 is a special, now rather rare, bottling (that Colin managed to pick up on the cheap – a benefit of working for the maker). The bottle itself is distinctively three-sided, a design brought in during the 1890s (hence the focus on the date), and collectors pay scary amounts for the bottles, even when empty. I suspect the actual blend is quite complicated, as the logistics of large scale blending require, but it seems that Dimple contains at least Linkwood, Glenkinchie, Dalwhinnie and a hint of Lagavulin in addition to the grain base, which explains some of its character. Colin advised us to try the Dimple with a bit of ice in, something that I usually find kills the flavour of a scotch, and was rather surprised to find that it retained a lot of its flavour even when chilled – the sweet wood carried on, making this work rather well. We switched back and forth between nosing the first two whiskies before we tasted #1 and learned what it was, and there was a massive difference between the two. Whisky #2 was very bourbon-like, with astringent wood, thick sour fruit and a caramel sweetness on the nose. It made the nostril hairs quiver as well, suggesting that it was a bit stronger than the Dimple. To taste it had concentrated raisin fruit and sherried wood, going from sweet wine to sour wood. It had hints of PX and was wonderfully rich. A bit of water knocked out the alcoholic burn, bringing out the raisin sweetness further and softening the wood in the finish. It reminded me of one of my whiskies and turned out to be from the same distillery – it was a Duncan Taylor bottling of 32 year old Port Dundas. I’ve got a 14 year old AD Rattray bottling which I rather like but this blew it out of the water. Port Dundas is the recently closed grain distillery in Glasgow whose whisky I liked so much at the blending class I did with John Glaser and this is a single cask bottling of sherried whisky from the Duncan Taylor ‘Rare Auld’ range. There aren’t many bottlings of Dundas, but I recommend you grab one if you see one. Next we moved on to tasting individual whiskies rather than immediate comparisons, with Colin hiding the lable on the rather distinctive square bottle with his hand as he poured. He started with a brief hint that this whisky was only available in Dubai airport’s duty free shop but quickly gave in and announced what it was – Johnnie Walker Double Black. This is a new blend from the Johnnie Walker stable, complimenting the range by being a premium version of the regular Black (with a 15-20% price premium). Whisky tastes very much change over time, with the 80s and 90s being hard for the Islay distilleries due to the fashion of drinking less peaty spirit causing a reduction of production (including the intermittent operation and eventual closing of Ardbeg). This has now come back to haunt the industry as old peated spirit is rarer and the modern taste for peaty whisky is hitting the stocks quite heavily. This new bottling is a modification of the regular black to appeal to those current taste, with more whisky matured in heavily charred casks and more peaty whisky (including Caol Ila and Lagavulin) for the smoke and peat sought after by many whisky drinkers today. On the nose it’s quite light with a hint of smoke and dry wood. To taste it’s a bit more interesting, with both wood and peat smoke, some fresh cracked stone, a hint of sweet alcohol and a dry burnt wood finish. It feels like a more refined version of Black Bottle (the blend made with whisky from each of the Islay distilleries), which seems to be precisely what the whisky’s intention is. It should be available in the UK later this year. Next up was another one with the label obscured by Colin’s hand that we tasted blind. On the nose it had a hint of grain (wheat?) and perfumed sandalwood. It developed in the glass bringing in lightly prickly spice, meatiness, nuts and fruitiness – dried pineapple, citrus and fruity haribo chews. Water brought out more wood and more of the perfumed nature, with flowers and wood polish. It was really rather impressive and quite an intense flavour, which led to the reveal being a bit of a shock – it was a Rosebank. The distillery is now closed, shut down in 1993 in favour of Glenkinchie, the other lowland in United Distillers’ portfolio. These days United Distillers are part of Diageo (who also own the name, which is bad news for the builders of the new distillery on almost the same site) and the Rosebank distillery is some building-in-progress flats and a Beefeater. The regular bottling used to be an 8 year old and it was famed for being light and perfumed, but this one is both older and rather a lot bigger than that version. In addition to its age it was also put into the cask at a much higher strength than usual, about 80% instead of the regular 62ish%. 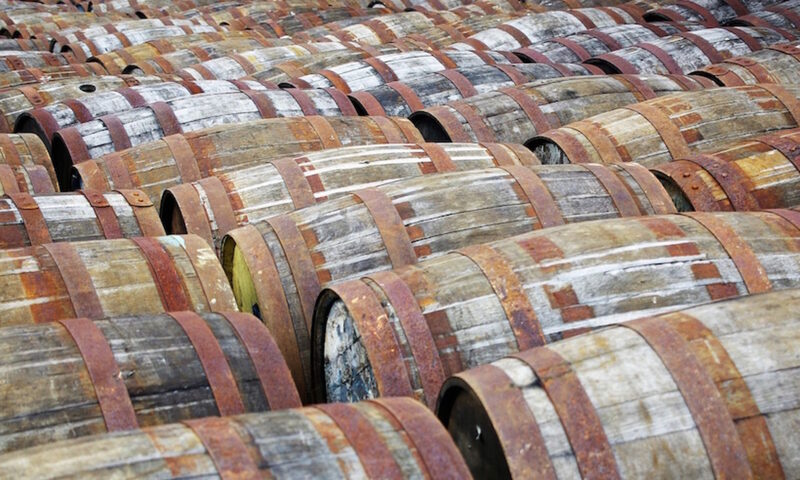 Whisky is often watered down before being put in the cask, with low 60%s being common and generally accepted as the level at which the whisky matures best. This upping in initial strength has led in turn to less alcohol evaporating and its cask strength bottling at a rather strong 62.3%, despite the 20 years of maturation. 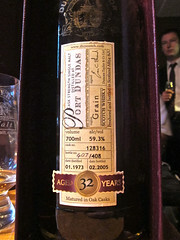 For me this was the most impressive whisky of the night, even if it wasn’t my favourite. We then moved onto the final pair of the night, part of the Classic Malts Distiller’s Editions range. Originally started by United Distillers in the late 80s, The Classic Malts collection is a range of whiskies that helped to popularise the now commonly known whisky regions (although they didn’t have a Campbelltown distillery and brought in Oban as a ‘West Highland’ instead). Along with the regular expressions they also produced premium bottlings, making up The Distiller’s Editions range, made from casks selected by the distillery managers. I’ve tried a few of them, with the Cragganmore one being my favourite whisky during my university days. 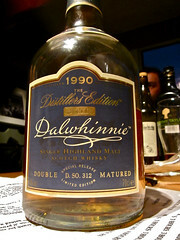 First of the pair was the Dalwhinnie Distiller’s Edition, taking the regular 15 year expression and finishing it for a couple of years in olosoro sherry casks. On the nose it was fruity with vanilla, digestive biscuits (milk chocolate ones), maybe with a hint of fruity shortbread. To taste it had thick custard, sweet sherry wood, juicy sultanas and an oily mouth feel. Water lightened things, bringing out more wood and giving a thick custardy finish. While the Port Dundas was my favourite of the night, this was a close runner up and one that I have much more chance of finding. I’ve been a fan of the regular Dalwhinnie for a while (I’ve been to the distillery a few times and have recommended it as an introductory dram for many people) but I’ve somehow managed to miss this until now – it’s on the ‘to buy’ list. 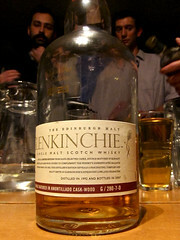 Drawing the night to a close we moved to the lightest whisky – the Glenkinchie Distiller’s Edition. Glenkinchie is The Classic Malts’ lowland member, based just outside of Edinburgh. 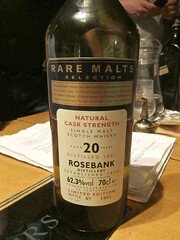 It survived where Rosebank didn’t due to the possibility of expanding the distillery, adding more capacity as well as a visitors centre, which was not possible on the space constrained Rosebank site. It now sits in the portfolio as the light and floral lowland whisky and this definitely comes across in the flavour. Building on the regular 12 year old this is a 15 year old finished in amontillado casks. On the nose it was light, with coconut, vanilla, hints of wood and a few raisins. To taste it was perfumed with flowers and wood polish joining the custard and woodiness, softening to an almost sherberty finish. Water simplified things, bringing out the vanilla wood flavours over everything else. It was a step up in oomph from the other Glenkinchie that I’ve tried and a worthy part of the Distiller’s Edition stable. The night ended with the traditional descending into the bar for a couple of beers, with Colin running away into the night with his whisky case, leaving a couple of bottles for us to continue sampling. Again, a rather good tasting with Colin’s “Force of Nature” presentation style calming over the evening and keeping everyone drinking, entertained and informed. Blended scotch malt whisky. 40%. Not generally available. Pingback: jasonbstanding.com » Blog Archive » Whisky galore, and more. For sure.